Whether you know this plant by its scientific name, Polygonatum, or the more poetic and biblical variant, Solomon's Seal, this plant is always a welcome addition to the woodland or shade garden. In mid spring, a single unbranched arching stem arises from the rhizome. Bright green elliptical leaves, arranged alternately up the stem are held upright like the wings of a bird on the upstroke of flight. Polygonatum multiflorum is a long cultivated pan-European perennial that forms arching stems 50 to 100cm (25 to 40in) long of alternate bright green leaves. They have very marked longitudinal ribbing on their surfaces and have the character of all facing the same direction. During May and June drooping clusters of two to seven tubular flowers spring from the axils of the leaves and hang in the opposite direction to the foliage. The long white bell like flowers are edged with tiny lime-green petals and are typically recurved at the tips. They are succeeded by small berries about the size of a pea, of a blackish-blue colour, varying to purple and red, they contain three or four seeds. 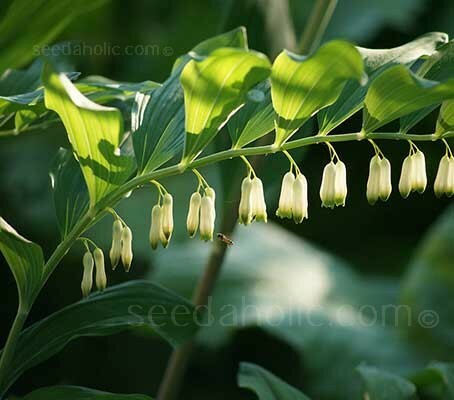 Solomon’s Seal are ideal for shaded or woodland gardens where they can be allowed to grow undisturbed. In the border, they can be combined with all manner of shade loving perennials and look wonderful amongst native ferns. The stems of Polygonatum being leafless near the base, allow enough light through for others plants to grow well. Use them behind cyclamen or hostas, or among hellebores, corydalis, dicentra and wood anemones. They can also be planted with low ground cover such as ajuga and tiarella above which the arching stems can emerge. 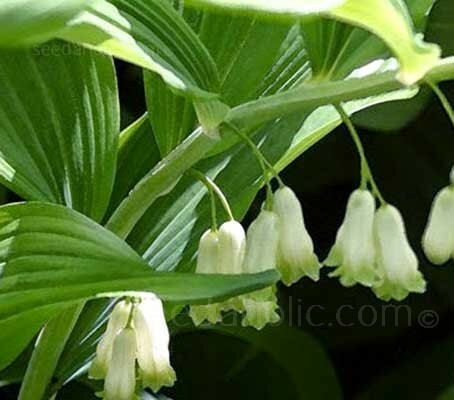 Solomon’s Seal is a very hardy plant that is easy to grow and long lived. They can be slow to establish, but once settled in will thrive and multiply. The plant thrives in a position in partial shade or full sun, in well drained, moist, humus-rich soil with an acidic pH. They will be better for occasional liberal dressings of leaf mould, or an annual top dressing of decayed manure in early spring. In late summer, the flowers are followed by plump, pea-sized blue-black berries. 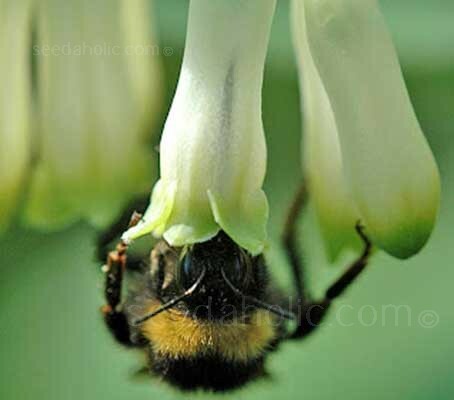 The flowers attract pollinating insects such as bees that will feed on its nectar. 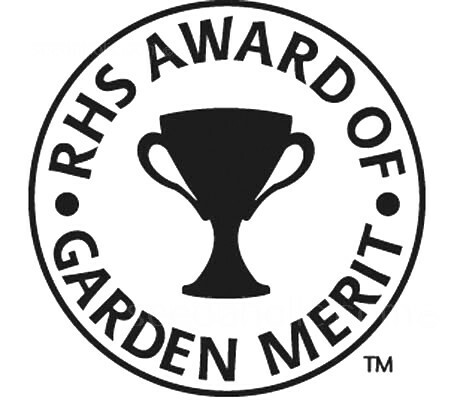 Polygonatum multiflorum has been awarded the RHS Award of Garden Merit (AGM). Sowing: Sow at any time of the year. Patience is a virtue especially in gardening. Growing Polygonatum plants from seed is slow, the seeds germinate in anything from one to eighteen months. The seeds can be left to go through the seasons naturally or, if required sooner germination can be hastened by stratifying the seeds (imitating the changing temperatures of the seasons). Fill pots or trays containing good quality seed starting compost. Moisten by standing the trays in water. Sow the seeds on the surface, pressing them into the soil and cover with a little compost and fine grit. Place the containers outside in a cold frame or plunge them up to the rims in a shady part of the garden border. The first method is to sow the seeds as above and leave for 2 to 4 weeks. Then chill the remaining seeds: put the tray into the refrigerator at -4°C to +4°C (24-39°F), or somewhere with a similar temperature for 2 weeks. Then remove to around 10°C (50°F). The normal temperature of a fridge is 4°C (very useful!). Don’t put the seeds into the freezer, it will kill them. Transplant any seedlings that have germinated, leave the tray out of the fridge for four weeks then and put back in the fridge for a second time for 4 weeks. Transplant any seedlings that have germinated. The second method is useful if you do not have spare room in the fridge. Place the seeds between two pieces of damp filter paper or folded kitchen roll then put into a polythene bag and place this into the fridge. Inspect the seeds after two weeks and remove as the seedlings appear, sow the seeds into pots and return the ungerminated seeds to the fridge. A number of seeds need a period of warm-cold-warm before they will germinate and with some species, such as Polygonatum a second period in the fridge can also be useful. Any seeds that have not germinated may lay dormant until next spring. Don't throw away the pots too soon. Put the pots in a shaded spot and inspect them occasionally. When seedlings have their first pair of true leaves and are large enough to handle, transplant into 7.5cm (3in) pots containing peaty compost. Place pots in a coldframe to grow on for their first winter. Once they are large enough, plant seedlings in a corner of a woodland border or under a deciduous trees and shrubs. Lay out the plants randomly to get a natural look, plant only 5cm (2in) deep and about 20cm (8in) apart. Plant out in a cool position in dappled shade. They grow best in fertile, reasonably moist locations in soils with an acidic pH. Choose a place that isn’t disturbed, and not crowded by shrubs or other plants because the thick shoots emerge late from just below the surface and they are easily damaged in areas that are regularly dug or walked on. They are lovers of cool soil and will not thrive in hot positions, although they don’t seem to mind dryish shade once established, especially if leaf litter covers them in autumn to provide a humus-rich mulch. Sometimes you have to move polygonatums around the garden before finding a spot they are really happy in, but they are worth it. Once a suitable area has been found, they will spread, but not invasively so. A good clump of Solomon’s seal takes time and patience but, once established, they are undemanding. Keep the soil moist in summer as this produces large clumps more quickly. The berry crop is usually quite scant as with many berries, they contain poisonous alkaloids and saponins but in a fairly small amounts. The quantity produced is usually so small that there are no reported cases of poisoning. Ingestion of a very large quantity would be required but the plant is frequently subject to predation which means that it does not form the berries which might be attractive enough to encourage consumption. The rootstock is however not toxic and was sometimes used in the old days as food. In years of crop failure Solomon’s seal was milled to stretch out flower, it was regarded as one of the best emergency foods. The Solomon’s Seals are all herbaceous rhizomatous perennials that can form large, bold colonies but patience will be needed while you await their spread. Division of large colonies of Solomon’s Seal should be done in late winter before plants begin to grow. The best time to transplant is in autumn, after the stalks decay, but it may safely be done at any time if taken up with plenty of soil, until they begin to shoot in the spring, when the ground should be dug about them and kept clean from weeds. They should also have room to spread and should not be divided more than every third or fourth year. Divide in late winter or spring as they buds break from the rhizomes. Chop into sections, making sure there’s a bud at the top. Re-plant in friable, humus-rich soil or pot up and plant out the following autumn. The root-stock is thick and white, twisted and full of knots, with circular scars at intervals, left by the leaf stems of previous years. You can estimate the plant's age by examining the rhizome. Each year the stem leaves a scar, or ‘seal’ on the rhizome. Counting these will give you an idea of how long your plant has been alive. When harvesting the roots, leave several inches (or 3 to 4 nodes) of the newest portion untouched so that you don't kill or damage the plant. Always harvest/wildcraft with care and respect for the plant and its surrounding habitat. Woodlands and naturalised settings, Shaded borders and gardens, Underplanting of deciduous trees. About 50 species of Solomon’s Seals are described in botanical literature. There are several species that are native to the deciduous and mixed forests of North America, most of Northern Europe and Asia. They inhabit broad-leaved forests and groves, shore-side forests and coppices. Three species of Polygonatum are native to Britain, these include the native Solomon's-seal (P. multiflorum), Angular Solomon's-seal (P. odoratum) and Whorled Solomon's-seal (P. verticillatum). Additionally the hybrid Garden Solomon's-seal (P. x hydridum) is recorded. Whorled Solomon's-seal (P. verticillatum) is protected under Schedule 8 of the Wildlife and Countryside Act, 1981 and in Northern Ireland the hybrid Polygonatum multiflorum x odoratum can be found. Polygonatum multiflorum is a native of Northern Europe to Siberia, In England it is found, though rarely, growing wild in woods in York, Kent and Devon, but where found in Scotland and Ireland is regarded as naturalised. Polygonatum multiflorum is a much rarer than its more common relative Polygonatum odoratum, angular or scented Solomon’s seal. P. multiflorum has been hybridised with the more common P. odoratum and the resulting garden Solomon’s seal (P. x hybridum) is grown in the shady parts of the garden. As many other hybrids, the garden Solomon’s seal becomes more vigorous than either of its parents. These plants are former members of the lily family, Convallariaceae but are now classified as belonging to the asparagus family, Asparagaceae. Several similar species are cultivated as popular garden ornamentals. If it is difficult to differentiate the species then good things to compare are the roundness of the base of the stem, the leaf formation and the amount of flowers. Polygonatum odoratum, Angular Solomon’s seal’s close relative Polygonatum multiflorum can grow up to double the size of its close relative. Polygonatum odoratum is different in leaf formation. Rather than a ladder of opposite ‘rungs’ it has alternative leaves arranged singly on dark stems. The leaves are generally more oval and in a brighter green. The stem of Polygonatum odoratum is grooved while Polygonatum multiflorum is glossy and round. The white flowers of P. odoratum are axillary, usually solitary and in pairs on the lower part of the stem, while P. multiflorum flowers are usually in small groups of three or four. (although there can be two to seven). A good way to remember this is that the word multi means ‘many’ and florum means 'flower', indicating that it has more flowers. The generic name Polygonatum derives from the Greek polys meaning many, and gony meaning generations. It refers to the ‘many-angled’ knots on the root or the numerous joints on the stems. Gerard, in his 1630 herbal, used the name Polygonatum latifolium for the same species, beating Linnaeus to the punch by over a century. The species name multiflorum refers to the flowers. Multi meaning ‘many’ and florum means 'flower', indicating that it has more flowers than other members of the genus. The species Polygonatum multiflorum is often called the Common Solomon's Seal, native to Europe it has been long cultivated for its use as a medicinal herb. Interestingly it is anything but common, it being one of the most rare forms to be found in the wild. Other common names include Solomons Seal, Lady's Seals, Saint Mary's Seal, Sealwort, Sigillum Sanctae Mariae, Yu Zhu, True Solomon's Seal, Dropberry, Sealroot, American Solomon's Seal, King Solomon's Seal, King Solomon's-seal and Sow's Teats. The common name Solomon’s Seal is believed to refer to the flat, round scars on the rootstocks, resembling the impressions of a seal, and when the root is cut transversely, it resembles Hebrew characters, giving rise to the legend that the wise King Solomon, who knew of the virtues of the roots, set his seal upon them. According to legend King Solomon used the magical powers of the root to turn large boulders into suitable building material for his temple. Most Polygonatum species have arching stems with pairs of leaves, which give rise to yet another common name 'Ladder in Heaven'. Prefers well drained, moist, humus-rich soil with an acidic pH.